Happy Sunday and happy first report card of the year…go New Year’s resolutions! This week was an interesting mix of mostly being on track and a few small disasters…largely in the kitchen. We’ve been talking about spending our our Christmas money and some of my consulting money on a portable dishwasher, which I would love!! I can’t remember ever living anywhere without a dishwasher (that shows my age, doesn’t it?) and it’s much harder than I thought it would be when we moved in. Since we’re 90% sure we’ll renew our lease next fall it seems like it would be worth it. We just need to get through January to make sure we don’t need the money for other things. I actually spent $126 at the grocery store today (gulp) buying ingredients to try out some new recipes, and then we decided to have a living room picnic with take-out for dinner, so that wiped us out for the week. We’re going to be close on some other areas of the budget this month, so we have to see how things go. Take out was worth it, though. The last time I ate Chinese take out was in NY at my friend Margarete’s house right before I moved, and Nora has never had any. 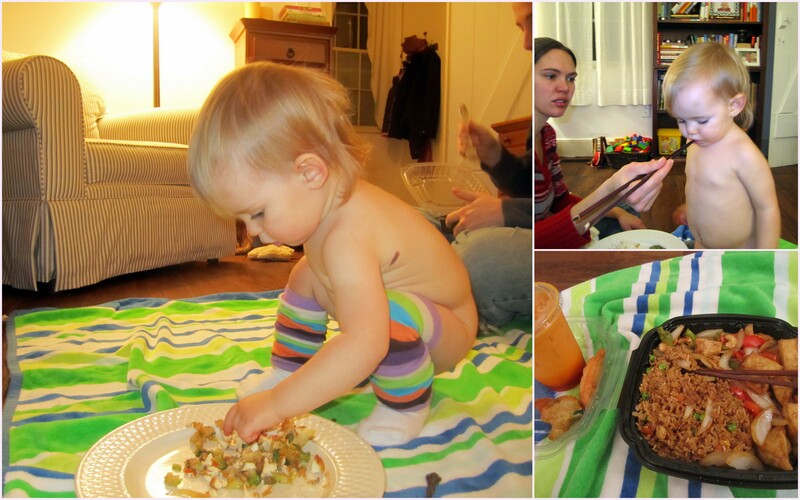 I’d say it was a big success, although she mostly ate the tofu (her favorite thing) and the peas out of my rice. 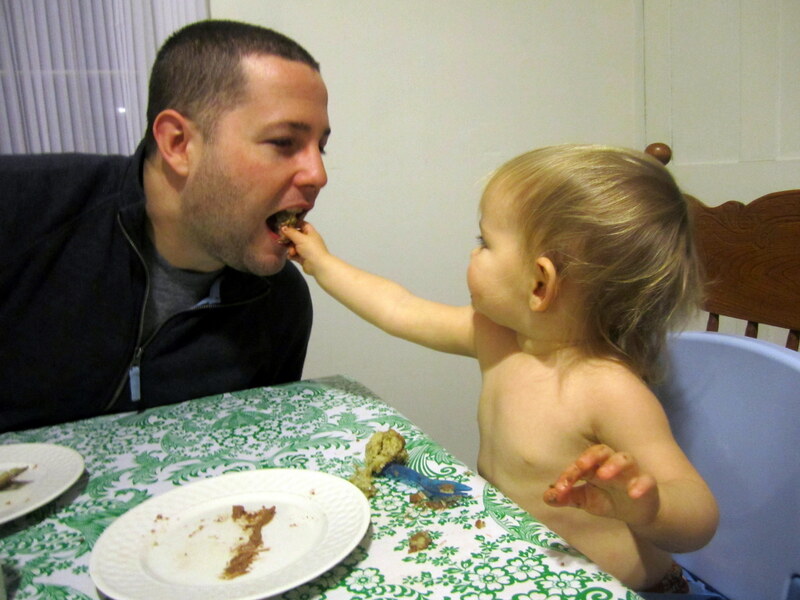 We’ve been doing a decent job introducing Nora to new flavors, and take-out Chinese totally counts as a “varied” meal, and it’s mostly balanced…with an extra helping of grease! 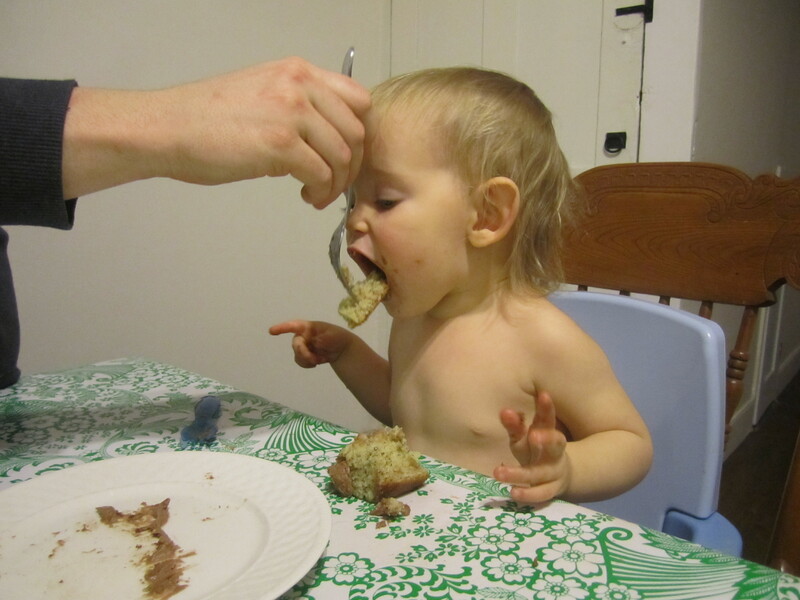 Luckily the rest of the week she’ll be eating things like kale lasagna diavolo, brussel sprouts with walnuts and dried cranberries, cannelli au gratin, rice and chickpea kale rolls with pineapple salsa, and toasted millet with harissa and sweet potato soup. If all goes well, next week I’ll have a bunch of delicious, healthy recipes to share. Today though, it’s fudge-frosted banana cake. Which Nora loved. And loved to share. I’ve talked before about how we don’t buy bananas for political reasons, but we do like them and will eat them if they are free (or otherwise unsupported by our money). While my mom was here, she bought bananas for their family and didn’t eat them, so they gave them to us. Nora ate a few, but I specially saved three for what used to be one of my favorite cakes (before swearing off the evil fruit). 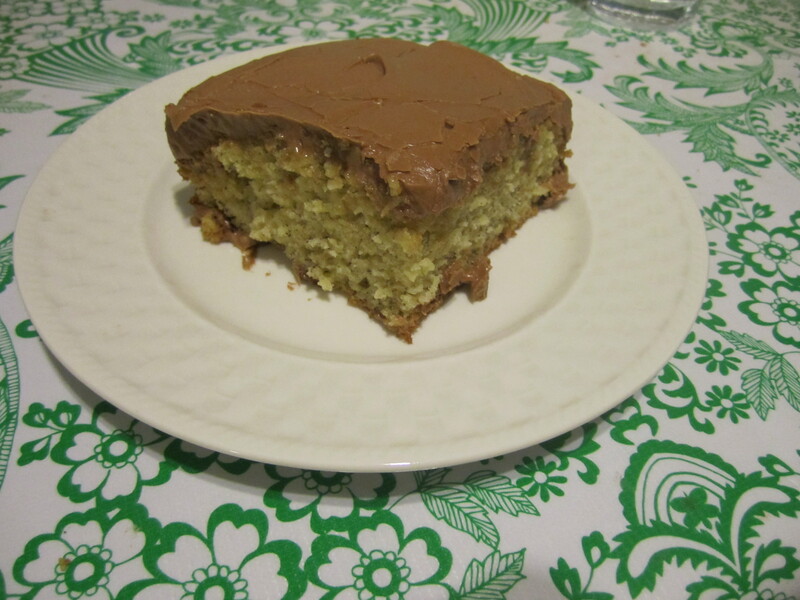 My mom often made it with penuche frosting, but this week I was feeling the banana-chocolate combination. Not that I want to encourage people to buy bananas, but if some happen to fall from the sky onto your kitchen counter, you have to try this recipe. 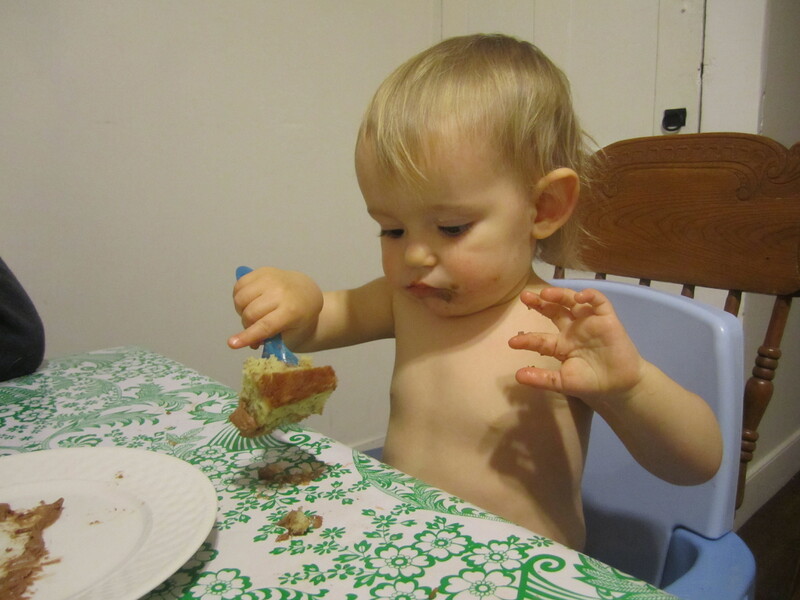 It was the first cake Nora had since her birthday and I think she loved it. The only other report of the week is more of an explanation of all the photos. 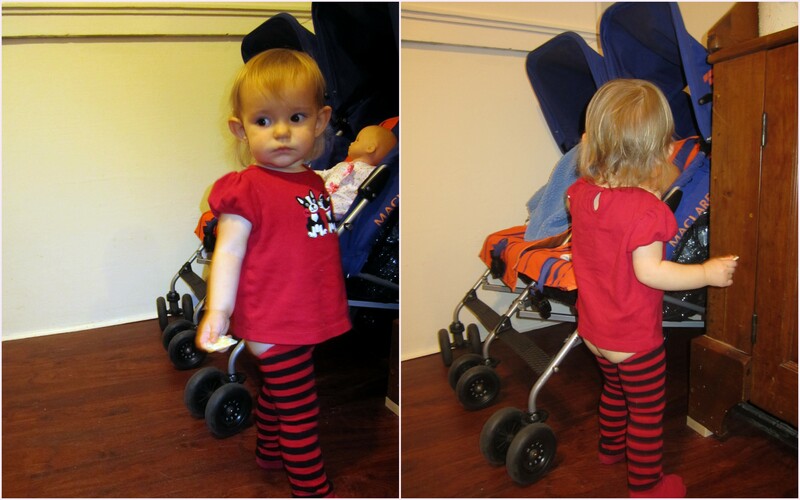 Nora spent nearly the entire month of December with a diaper rash, which turned out to be yeast related. When we took her to the doctor, beside prescribing a cream, he said the best thing would be to let her have some diaper free time. 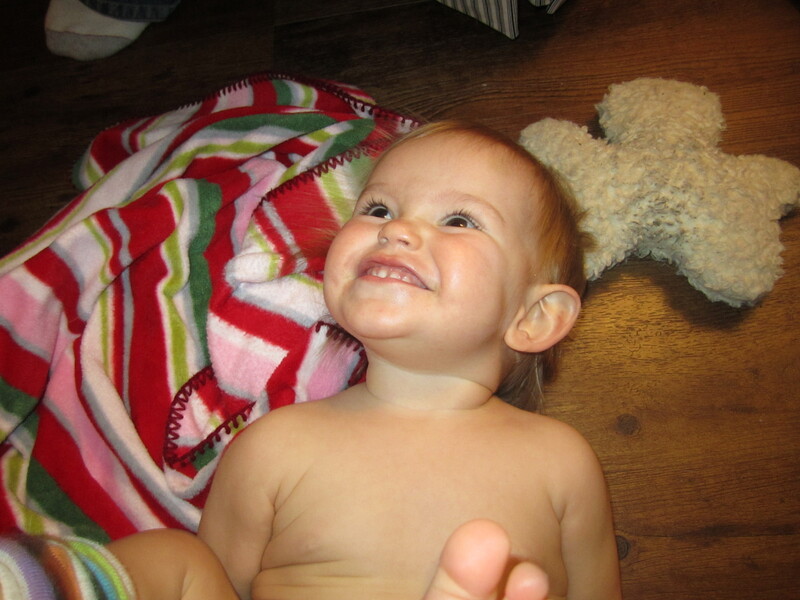 So, our little monkey has been spending every afternoon and evening running around like this: in a shirt, socks, and Baby Legs, or just plain naked. It’s been good because it’s encouraged me to work a little harder at potty training. She was peeing on the potty reliably over the fall, but I stopped putting her on it for a week or so and in that time she forgot what she was supposed to do and was no longer willing to just sit there until something happened. Then, I stopped trying for awhile. 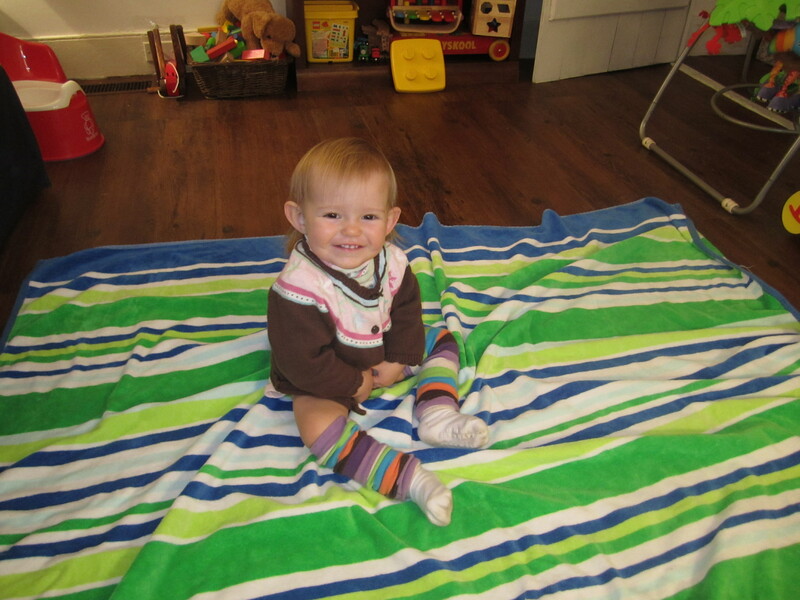 Having her diaper-free, kick started the potty training again and we’ve had some major break throughs. This week, she has started asking to have her diaper changed when it’s wet or dirty and I’m also getting better at telling when she needs to go. And Nora? She’s just having a grand old time. haha. I was smiling and laughing at the bar as I was reading this. The three women next to me thought I was eavesdropping on them. No idea what they were talking about, but I’m sure they’d find the pictures as cute as I did! I’m so glad some one else knows about penuche! !